Top view of artificial cilia, actuated in air. The length and the width of the individual cilia are 100 μm and 20 μm, respectively. The switching frequency is 1 Hz, and the applied AC voltage is 90 V/1 kHz. 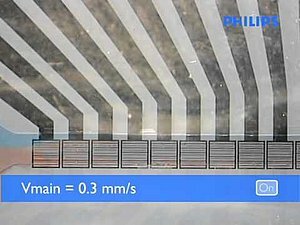 The field-of-view of this movie is about 1 by 1 mm2. 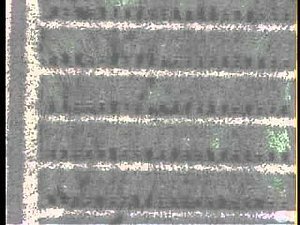 It shows a top-view of a segment consisting of five rows of twenty artificial cilia. To the left and to the right of the segment, outside the viewing area, similar segments are present. However, in these the roll-out direction of the artificial cilia is exactly opposite to that in the visible segment. A 0.5 mm thick film of silicone oil (viscosity 9.3 mPa⋅s) with dispersed TiO2 particles, seen as black dots, covers the cilia. At some point in time, the cilia are actuated with a switching frequency of 20 Hz and an AC voltage of 170V/1kHz. The movement of the cilia themselves is not very well visible, due to the mismatch between the switching frequency and the sampling rate of the frames. The two in-plane counter-rotating eddies that are observed, are caused by the opposite roll-out in the neighboring segments. Movie from a mixing visualization experiment using dyed silicone oils (viscosity 0.93 mPa⋅s) and mixing configuration design A-B-A. There is a continuous main flow from left to right, which is driven using pumps, with a mean velocity of 2 mm s-1. 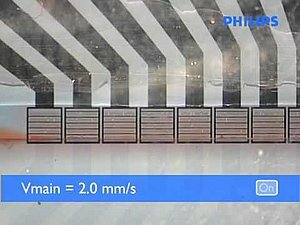 At the start of the movie, the artificial cilia are switched off and two separate, co-flowing, streams of fluid are present in the channel. At some point in time the artificial cilia are switched on with a frequency of 50 Hz at an AC voltage of 100V/1kHz. The movement of the cilia themselves is not visible due to the low frame rate of the camera. A meandering flow pattern almost immediately occurs, and within 1.5 s, the fluid is homogeneously mixed. This time corresponds to less than 1.5 cycles traveling distance. After switching off the actuation, the original, separated flows gradually re-appear. Movie of a mixing visualization experiment using dyed silicone oils, with viscosity 9.3 mPa⋅s and mixing configuration design C-D-C. The continuous externally driven main mean velocity (from left to right) is 0.33 mm s-1. At the start of the movie, the artificial cilia are switched off and two separate, co-flowing, fluid streams are present in the channel. At a certain time they are switched on with a frequency of 50 Hz at an AC voltage of 100V/1kHz. The movement of the cilia themselves is not visible due to the low frame rate of the camera. A meandering flow pattern emerges and the fluid is reasonably homogenized after about 9 seconds, which corresponds to about 1.5 cycles traveling distance. After switching off the actuation, the original, separated flows gradually re-appear.